In less than 30 minutes, reproduce an authentic restaurant quality Pakistani Karahi Chicken Recipe at home. This low carb Keto chicken recipe is a breeze to make and is also a Pressure cooker, Instant Pot Gem, or stovetop recipe, which makes it extremely versatile. The first thing I want to do is to thank Saira Ahmad for not only sharing her mother’s Pakistani Karahi chicken recipe with all of us, but also putting up with me when I first completely screwed it up. As it happens I ended up making a delicious Dry Chicken curry recipe with it, but I was aiming to replicate her traditional recipe. So then Saira had to explain what we were looking for—which was a karahi chicken with lots of ginger and tomato, and I tried again. Kadhai or Karahi or Kadai refers to a wok. Spell it however you want since Indians certainly do! Wok chicken sounds so simple–and it is indeed simple to make. 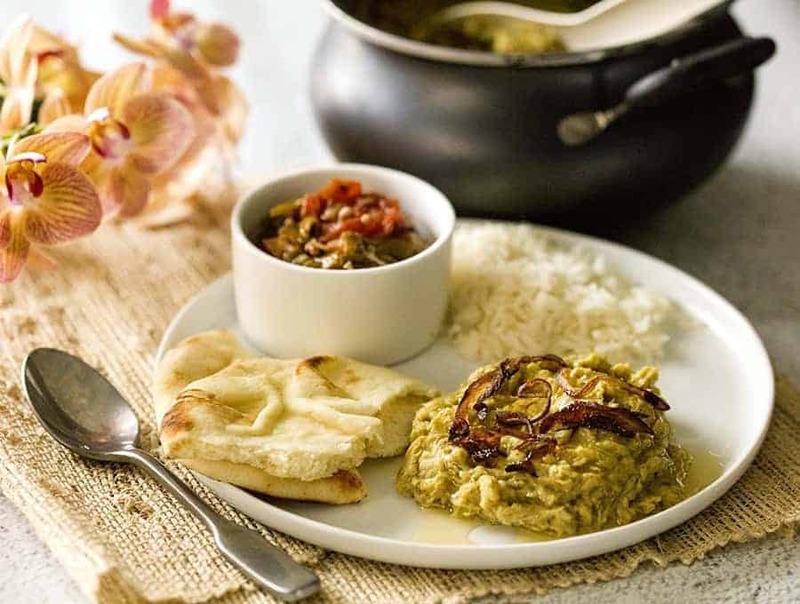 But the rich spiced taste belies the simplicity of the name as well as the ease of cooking. Many kadhai chicken recipes include sliced onions and bell peppers. You can certainly add those into this karahi chicken toward the last few minutes of cooking. 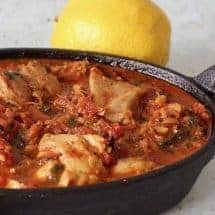 Basically, however, this is a great keto chicken recipe which takes almost no time to make, and for those of us who are tired of eating chicken, this doesn’t really taste like chicken all that much, thanks to all the other yummy ingredients. 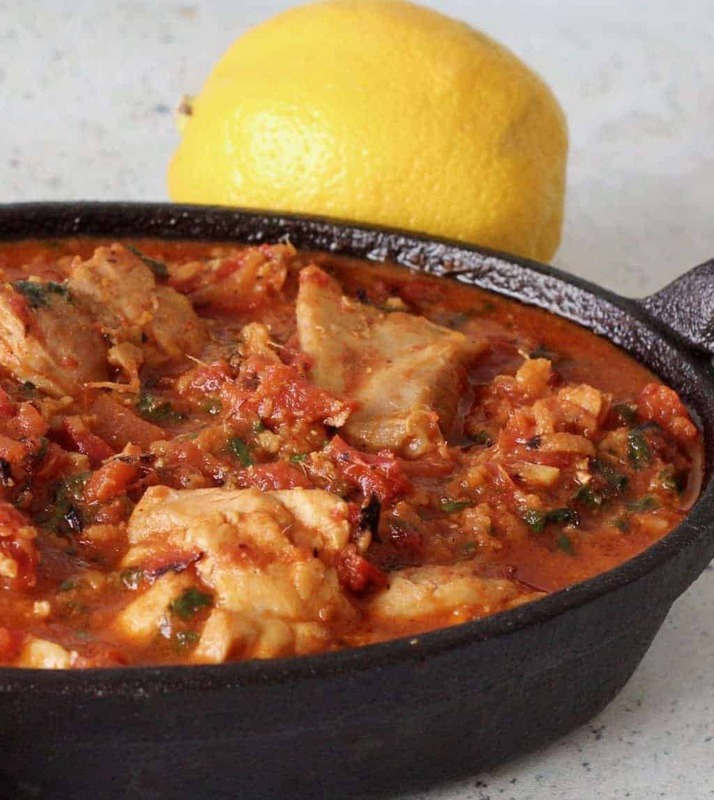 Look how little you need to make this fabulous Pakistani Karahi chicken recipe. Looking for more delicious Pakistani dishes to try? Check out my Instant Pot Pakistani Haleem! It’s an amazing comfort food with a nourishing mix of grains, lentils, and meat. 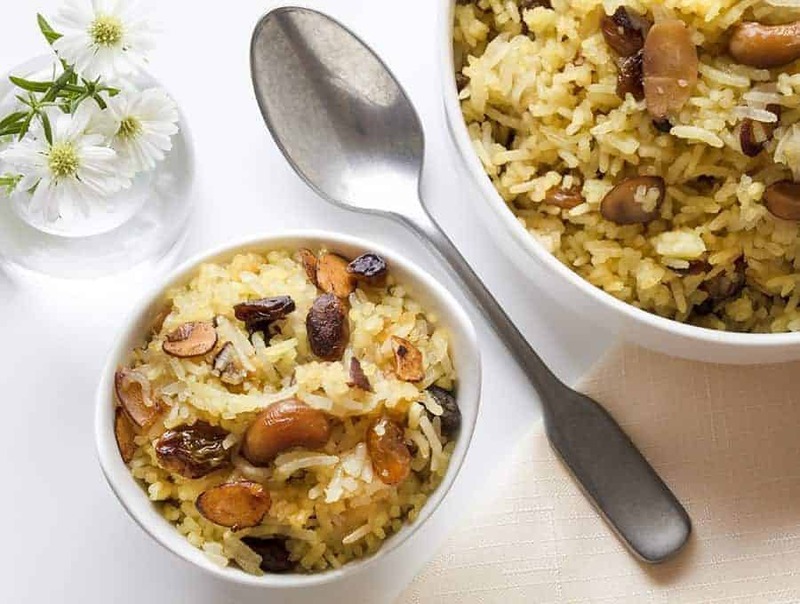 Another great Pakistani recipe is my Instant Pot Pakistani Zarda Sweet Rice. It’s a delicious and beautiful international dessert recipe that you’re sure to love! 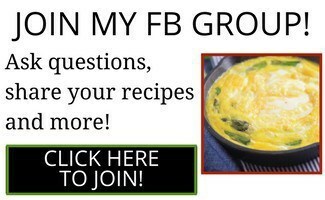 WHAT IS THIS INSTANT POT GEM OF WHICH YOU SPEAK? AND DO I NEED ONE TO MAKE THIS PAKISTANI KADHAI CHICKEN? 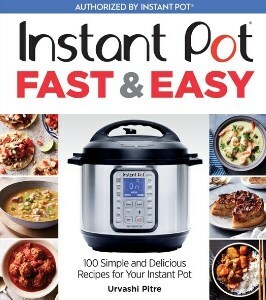 An Instant Pot Gem is my latest kitchen gadget love, and one that I think will be around for a long time. It’s not a pressure cooker, it’s a multi-cooker. It can sauté, steam, roast, bake, slow cook and stew at low temperatures. 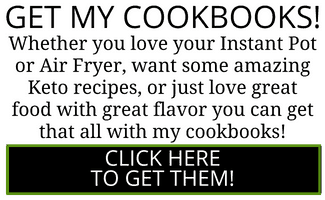 I’ve made a few other Instant Pot Gem recipes all of which have been, somewhat surprisingly, super popular amongst readers including a Butter Chicken Pizza , a French Garlic Chicken, Lebanese Hashweh, and I’m sure I’ll be making more. 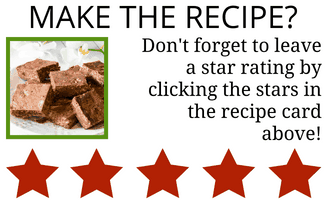 Must you have it for this recipe? No, you don’t have to. All you need is a wide 12-inch saucepan and you should be good to go. I used my Greenpan Magneto the second time and it cooked fabulously. 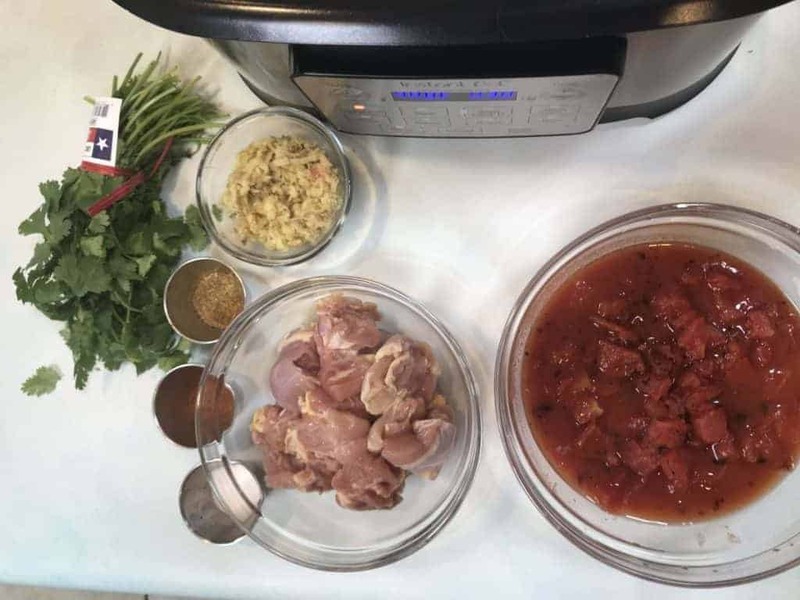 In less than 30 minutes, reproduce an authentic restaurant quality, low carb Pakistani Karahi chicken curry recipe at home in your Instant Pot! Fresh ginger cut into very thin matchsticks. Heat your Instant Pot Gem on sear/Sauté to 400F or on the stovetop, heat a nonstick 12-inch pan and when it's hot, add in the oil. You want a wide saucepan. To the hot oil, add the ginger.Note that I cut the ginger quite small. I made coins, then I made matchsticks, then I cut the dice. You want to do this so you don't get a huge chunk of ginger in any one bite. Cook the ginger for 2-3 minutes until the sides start to brown. Add the chicken and let the chicken sear on one side and then flip over. Add tomatoes and stir well. Mix in all the spices and stir. Cover the pot. Now, you're going to cook this lovely, fragrant mixture until it is all well-cooked. Do NOT add water. Stir once in a while. 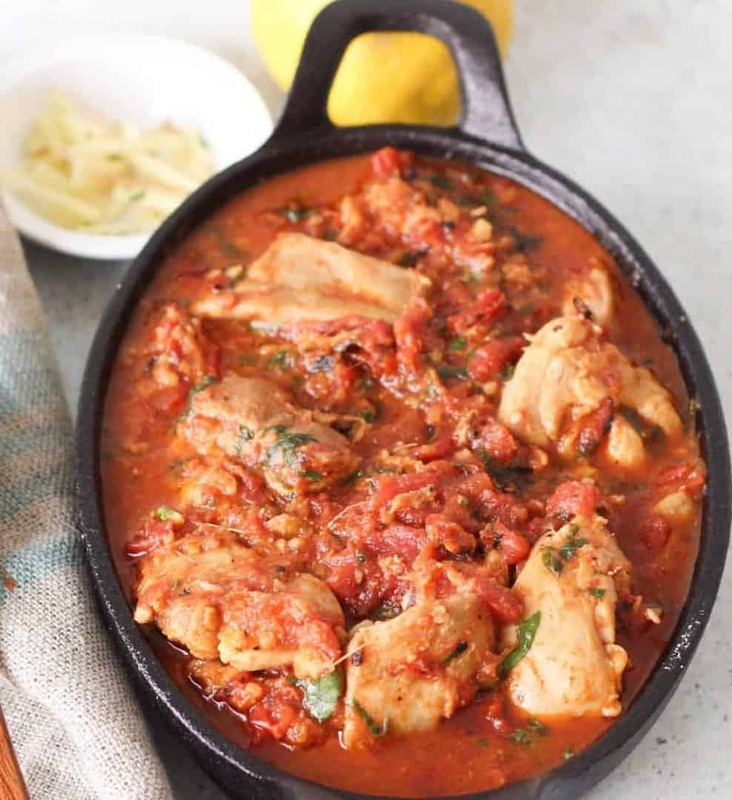 As the chicken and tomatoes cook, you're going to see the tomatoes mushing down, the chicken cooking and the sauce, or the gravy as we would call it, getting thicker and more homogenous. Soon, you will see a thin film of oil forming on the top. Some of this oil is what you added, some of it is what's being rendered out of any fat that was on the chicken. This is your best sign that the dish is ready to eat. This will take about 10-15 minutes. Add all the finishing ingredients and have at it! Heat your Instant Pot and when it's hot, add in the oil. To the hot oil, add the ginger. Note that I cut the ginger quite small. I made coins, then I made matchsticks, then I cut the dice. You want to do this so you don't get a huge chunk of ginger in any one bite. Cook the ginger for 2-3 minutes until the sides start to brown. Add the chicken, tomatoes, and spices, and stir well. You do not need to add any more water. Close the lid and cook at high pressure for 5 minutes, and let it release pressure naturally for 10 minutes. Then release all remaining pressure. You can use fresh tomatoes but if you do that in the Instant pot, add ¼ cup of water just in case your tomatoes aren’t juicy enough. In less than 30 minutes, reproduce an authentic restaurant quality Pakistani Karahi chicken curry recipe at home. Would I be able to substitute mutton for the chicken? My Pakistani husband Leo’s asking me to learn to make karai gosht I was wondering, do the spices stay the same? The fact is, it’s very flexible and you can make however you like. I cook by feel. So the first time I made it, I made it as written. The second time I made it, I made it as video’ed. Either way will work. But. I will try to do a better job keeping the two consistent so I don’t confuse everyone! Thank you for pointing out the discrepancy to me. I will pay closer attention.